The first manufactured telephone to reach Midland was around 1880, shortly after the incorporation of the Bell Telephone Company of Canada in April of that year. Owner of the first pair of telephones, installed between his bakery and his retail outlet two blocks away, was Henry S. Ruby who had come to Midland in 1875 from Barrie to establish the bakery. Acoustic telephones like Mr. Ruby’s required a straight piece of iron wire stretched between the two stations, no bends. Bells rigged up over the phones were rung by simply shaking one of the units. 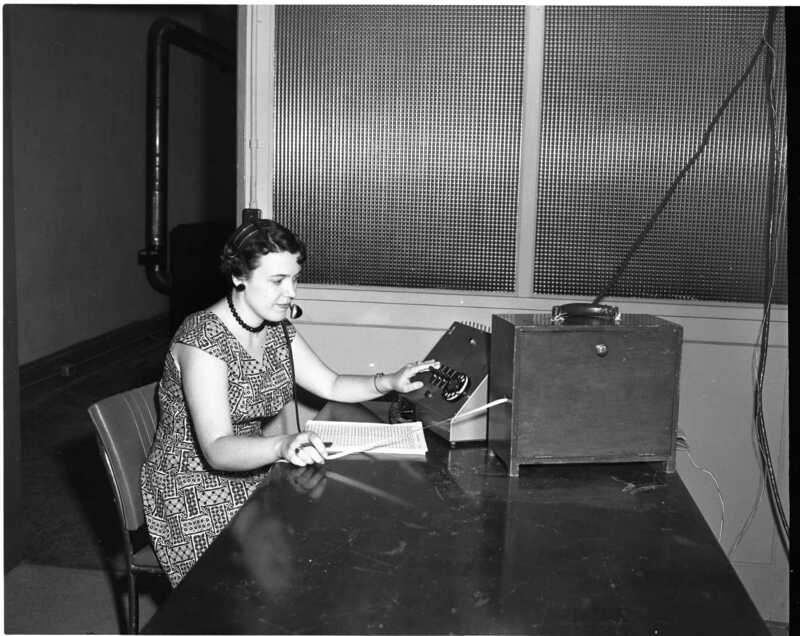 Ruby’s “acoustic telephone” is in the collection of Huronia Museum and is displayed below by former curator A. D. Tushingham. Mr. Tushingham was telephone manager and later “wire chief” at Midland from 1930 until his retirement in 1949. 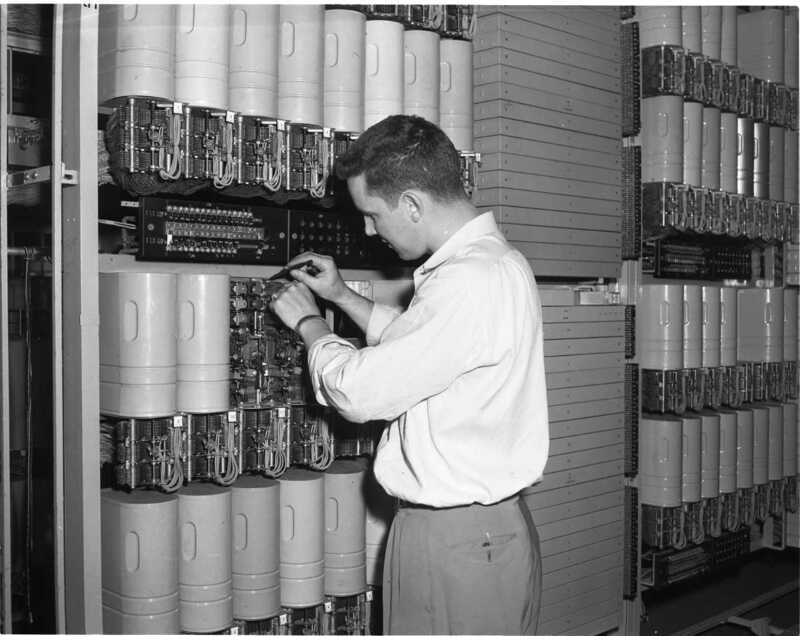 The phone systems that developed at that time were privately or municipally owned. Bell Telephone entered Midland in 1886 when a long distance line was constructed between Midland and Penetang. John White became the initial Bell agent and the exchange was set up in his grocery store at 243 King Street (now 261). He had six telephone customers. Two years later a long distance telephone line was constructed linking Penetang and Barrie. 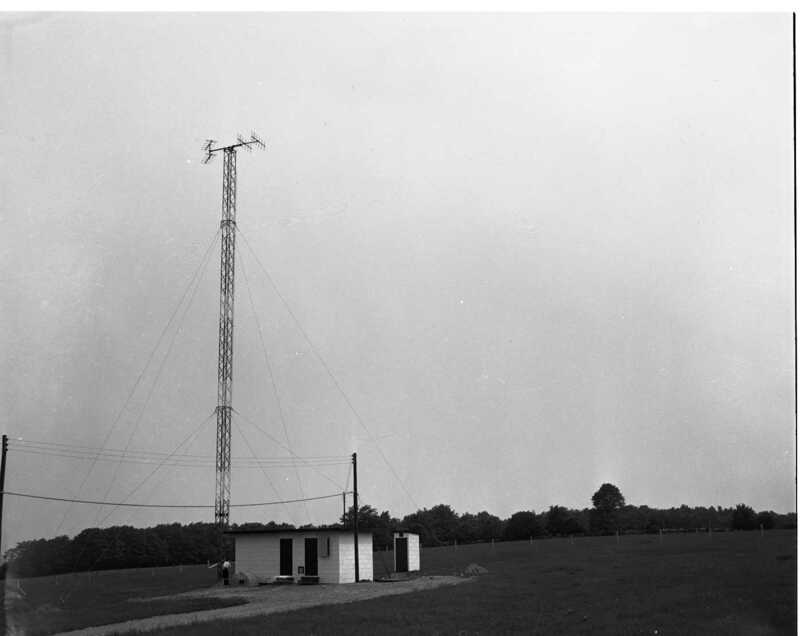 The line took more than 28 miles of poles and 42 miles of copper wire and linked Midland to the expanding telephone network in other parts of Ontario, Quebec and the United States. The November 1889 Midland Telephone Directory listed 17 customers, all of them businesses. 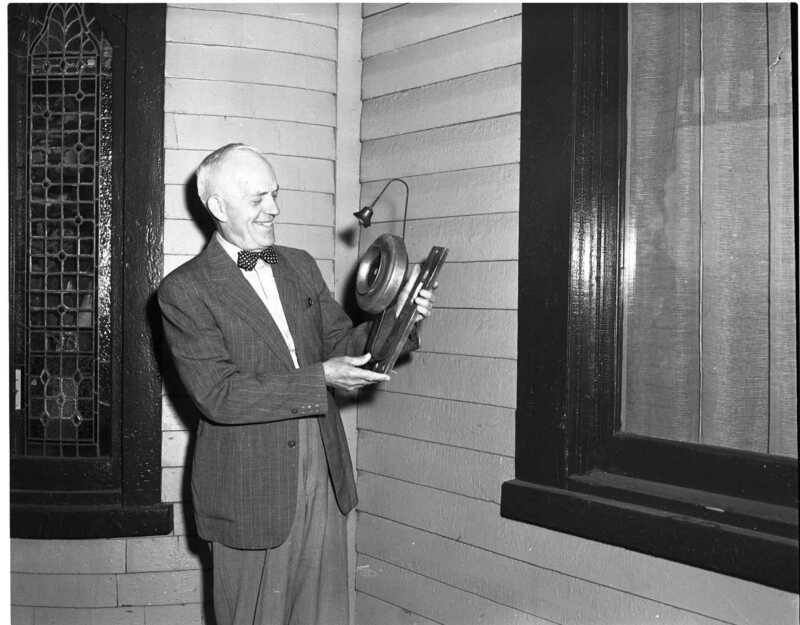 The listings were: Anderson, Jas., Anderson Fish and Tacking Co.; Clarkson House, J. B. McNaughton prop; Coutermanche, N., merchant King Street; Free Press office, P. J. Ryan editor, King Street; Grand Trunk Rwy. elevator; Grand Trunk Rwy. station, Dominion Ave.; Lynett, Rev. John, residence, Hugel Avenue; Midland Manufacturing Co., Third Street; Miscampbell, A., lumberman, mill office; Ontario Lumber Company, mill office; Peters, C.M., hardware merchant, King Street; Queen’s Hotel, William Rogers prop., King Street; Raikes, Dr. R. M. Midland Ave.; Sneath, C. R., drug store, King Street; Steers and Ambrose, barristers, King Street; Western Bank, King Street; White, John, grocer, King Street. In January of 1890, Midland was incorporated as a town. The population was getting close to two thousand and the number of telephone customers had risen to 21. In 1892 a fire destroyed Mr. White’s store and the telephone exchange. The salvaged equipment and grocery business was re-established at 234 King (near the Free Press ffice). 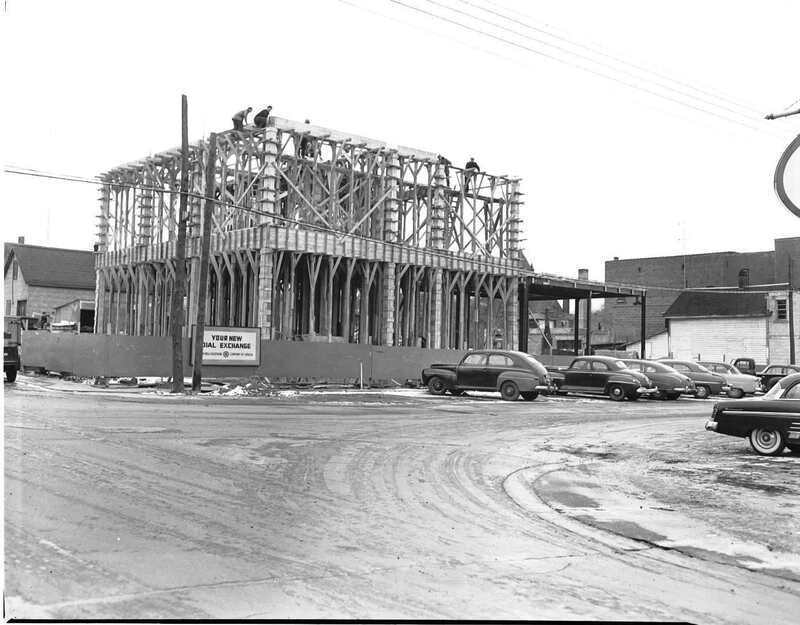 The exchange was moved twice more before 1920, first to 197 King (now 221) and later to its current (1956) location, 260 King (near Johnstones). Also in 1892 a long distance line connected Lafontaine to Penetang. A major changed occurred in May of 1900 when continuous 24 hour service was provided. A total of 70 listings appear in the Midland directory of December 1900. By July 1902 there were 86 subscribers and any remaining iron lines were replaced with copper wire resulting in a general improvement in transmission. In 1903 there were 100 phones in Midland and by 1910 there were 260 in use. A line from Elmvale to Penetang was constructed that year as well as a long distance line linking Midland and Orillia. John White was listed as agent for the last time in the April 1912 Midland directory. He had served the company for 26 years and his daughter Lilian, who had been Midland’s first operator, took over as agent. There was very little expansion during the war years. In 1919 the local staff consisted of Miss Lilian White, chief operator, Edward Robitaille, lineman, Frank Harbour, lineman, and operators Ada Smith, Mary Smith, Jean Ayres, Chilina Smith, Zada Molan and Ella Gillbanks. 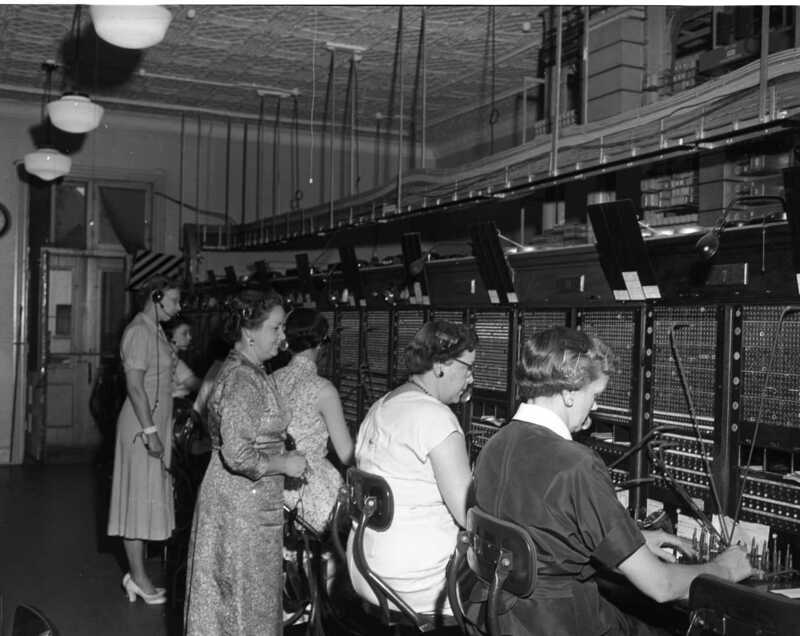 On May 5th, 1926, after years of “cranking” their telephones to get the operators attention, the system was updated to battery power and the switchboard enlarged to accommodate up to 1,200 customers. The chief operator was Helen L. McGrath. In 1931 there were 1,298 customers, but due to the stock market crash of 1929 and the ensuing depression, by 1935 there were only 984 customers. A. D. Tushingham became the local manager in 1931 and retired 19 years later. During the second world war resources were in short supply and the number of phones in Midland in December 1945 was 1,301, little changed from 1931. However by December 1949 the number had risen to 2,223. Bell employees in Midland numbered 26 and an average of 785 toll calls together with 9,698 local calls were being placed daily. 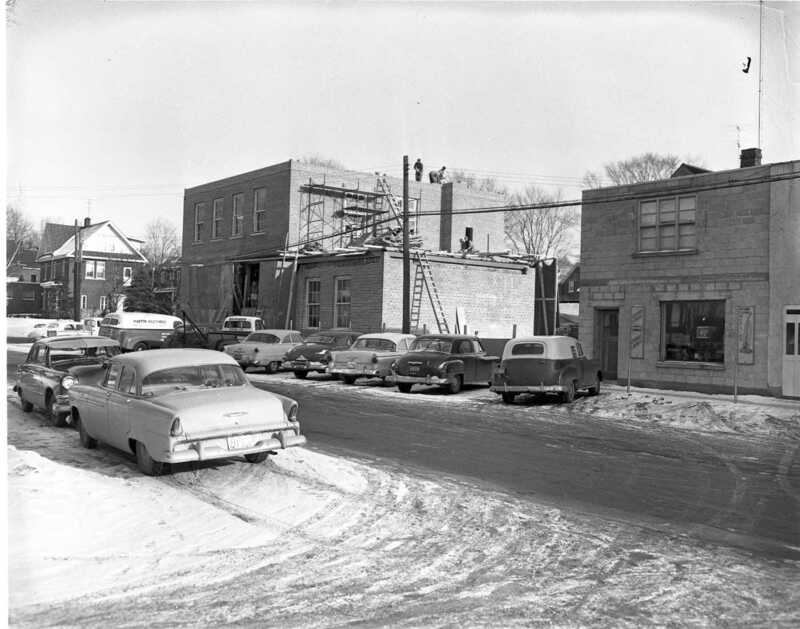 In 1950 the Bell Telephone Co. purchased property on the corner of Hugel and Midland Avenues. 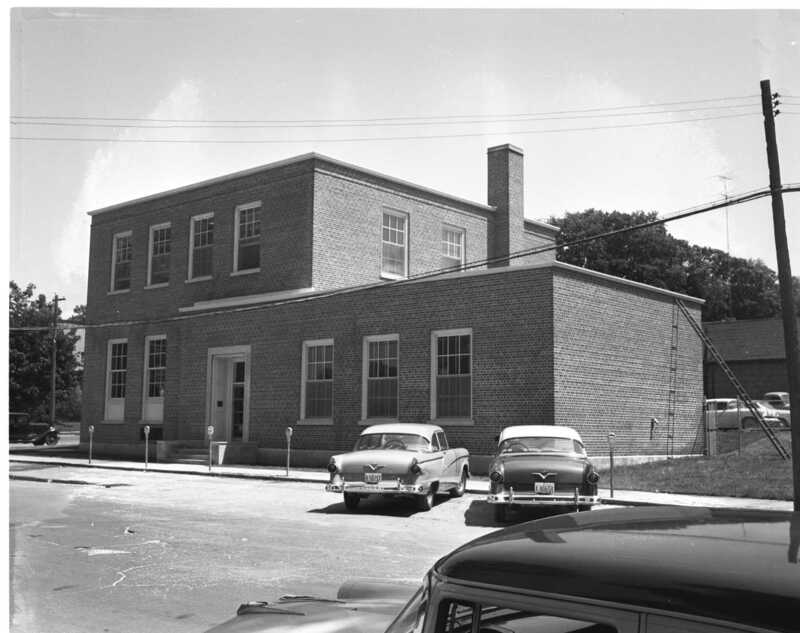 In 1951 the business offices were moved to 276 King St. (now 296 Leisure Sports former Midland Beauty Parlour). Before the end of the year, three new switchboards were added to the exchange for a total of seven local positions and nine long distance positions. More than 30 operators were busy placing an average of 900 long distance and 11,500 local calls daily. 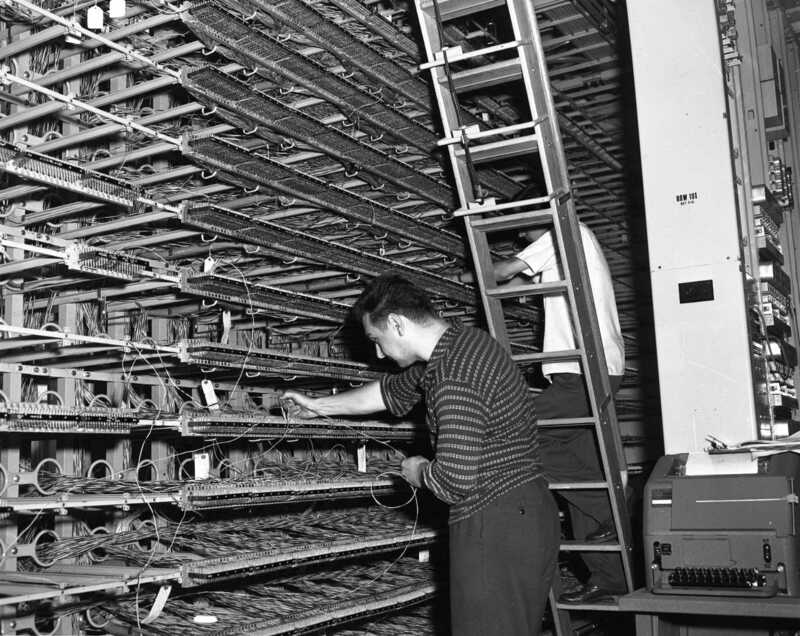 At present (July 1956) there are 2,870 phones in service. August 1955. 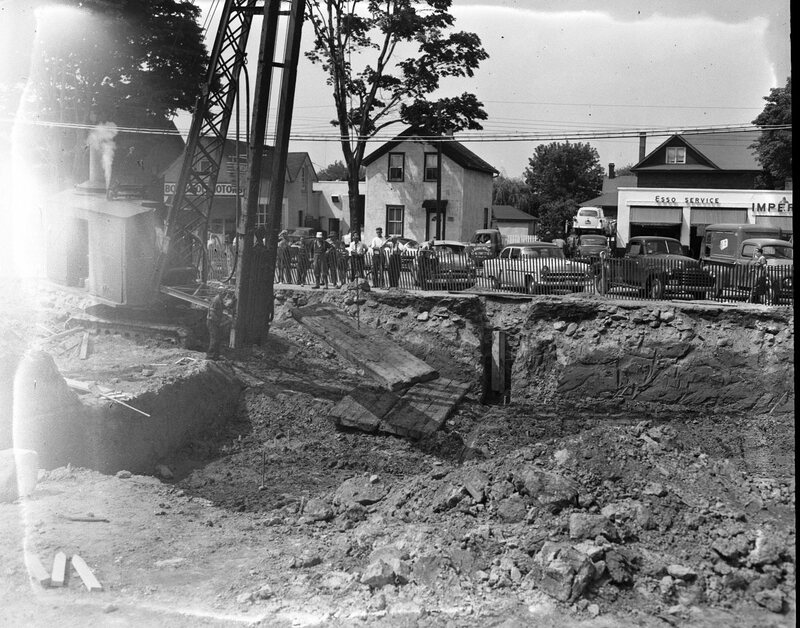 Sidewalk superintendents keep a close watch as the first piles are driven for the new Bell Telephone exchange and office building at Midland and Hugel Avenues. 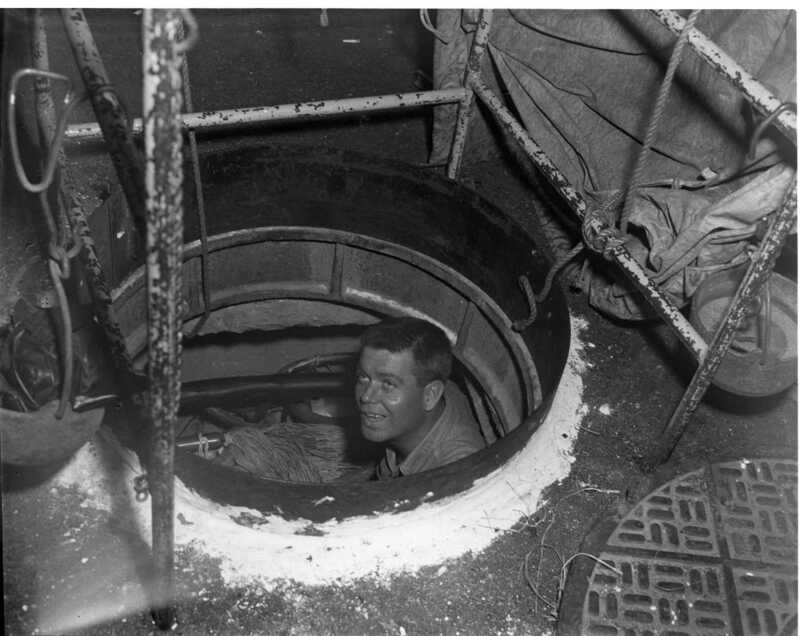 It was an added step when it was discovered that the ground was wet and unstable. The machine is placing large wooden timber mats upon which it traverses the wet ground. This was the site of the former Midland Woolen Mill. Bourgeois Motors can be seen in the background. November 1955. Pouring cement pillars on the upper floor of the new Bell Telephone Co. dial exchange building, southwest corner of Hugel and Midland Avenues. The building incorporates poured cement foundation, floors and roof, which is the reason for all the wooden forming and wooden support pillars. The general contractor for the project was the Emery Engineering and Contracting Company of Barrie. February 8, 1956. Despite the cold weather the brickwork is nearly complete on the new Bell Telephone exchange building on the corner of Hugel and Midland Avenues. The building is scheduled to open early next summer. The building will house the complex dial equipment on the first floor with the wire room and power supply equipment in the basement. The second floor will contain the new long distance exchange. The building is fireproof throughout with brick exterior and was designed to harmonize and add to the attractiveness of the neighbourhood. The 33 by 31 foot business office will be housed in the single storey area to the right. Business office staff were also busy prior to changeover obtaining and checking new listings, writing service orders and so on. Derys Stoodley, Rita Martin and Yvonne LeBlanc. 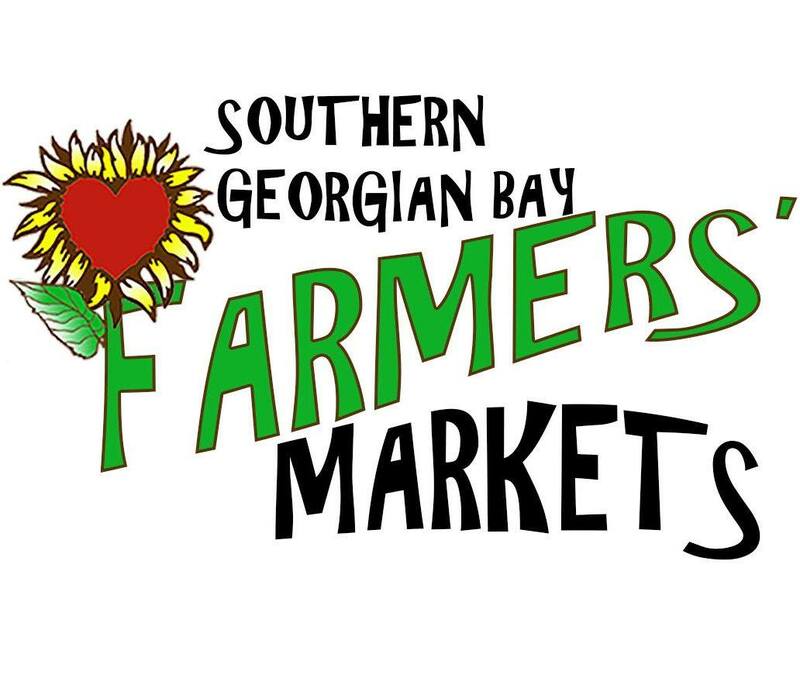 As part of the companies program to make sure all customers are familiar with the equipment employees have been calling customers in recent weeks to demonstrate the various tones heard and asking them to place a test call. Karen Small, pictured here, also visited local schools to demonstrate the dial system to the children. Bell had been installing dial phones or phones that could be converted to dial for quite some time before the actual change over. Training on the new long distance switchboard board was given to all permanent operators, the system will go into service with the conversion to dial. Operator Ruth Shaubel is seen putting through a test call as chief operator Helen L. McGrath observes. Miss Shaubel is using a set of keys, similar to those on an adding machine, to send out the number of a telephone in a distant city. 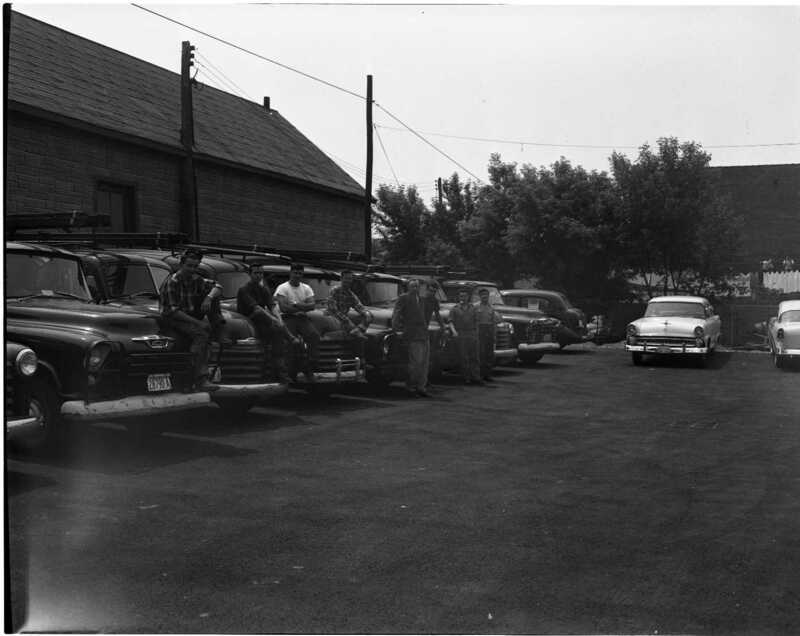 This crew of installers was busy for many weeks preparing for the cut over by placing new dial phones and services in local homes and businesses. Seen behind the new building with their trucks are; Jim Adlam, Bob Taylor, Ross Smith, Paul Hetherington, installation foreman Gordon Scott, Manfred Leimgardt, Bob Dunlop and Joe Markle. Part of the change over was the splicing of every phone line in Midland to the huge cables leading into the new dial exchange building on Hugel Ave. Stan Gilchrist, Bell splicer, is seen in at work splicing wires in a man hole on King Street. A Bell tower, two and half miles west of Midland in Tiny Township, was also put on line and will bring public phone service to Cognashene Island, Gloucester Pool, Six Mile Lake and Mclean Lake. Later this summer Go Home Bay will be added to the system. Some 1,000 cottages and several large summer hotels and lodges will be within reach of the new public phones. A check of the dials and indicators on the main power control board in the basement of the new dial telephone exchange reveals all is in readiness for the cutover of the Midland system to dial operation. Sim Panfound, central office expert, makes sure the battery charging equipment is functioning properly as he inspects the voltage regulation controls. 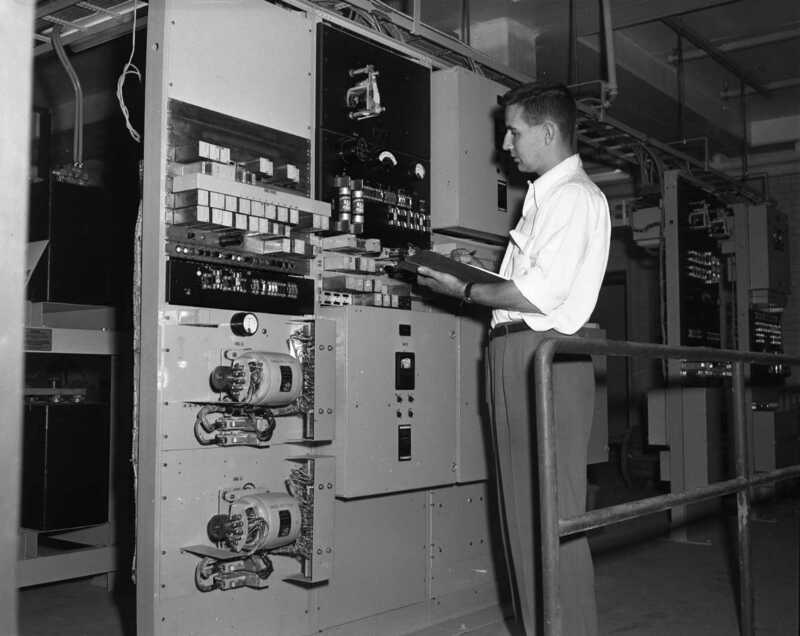 Eric Renkl, skilled Northern Electric employee is seen at work on the main distributing frame in the new Midland dial telephone exchange building. The frame provides the link between the cables serving the town and the dial switching equipment. Each pair of wires among the thousands leading from the cables must be matched with the corresponding pair leading to the dial switches and soldered together. Claude Kimball, Bell technician, checks the operation of some of the switches at the new Midland exchange. Normally the switches are covered with metal canisters to protect them from dust and dirt. The floors of this room are never swept, only wet mopped to prevent dust in the air and the room is air conditioned. This is the last photo of the manual phone exchange. All permanent employees will still be needed to staff the new long distance, information and assistance switchboards. 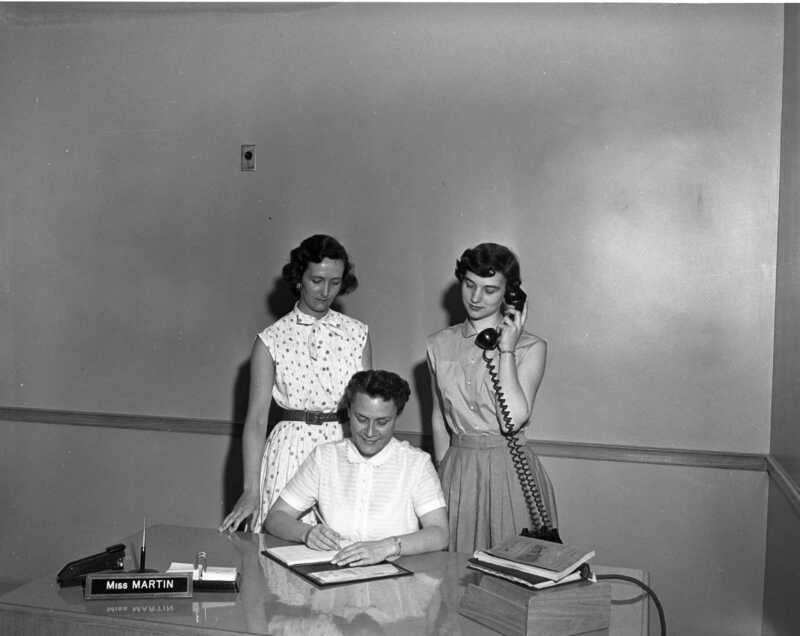 From the moment it was decided to convert Midland to automatic dialing provisions were made for staff. All permanent staff were guaranteed their employment, staff retiring or leaving were encouraged to stay until the switchover and new operators were hired on the understanding their jobs were only temporary. Standing left is Mrs. Laura Bacon supervisor and Miss Adilene Bell of Collingwood a chief operator who filled in for two weeks before the change. With the building complete and all preparations made the day arrived when the familiar “number, please” would be replaced by the hum of a dial tone. Bell selected a day and time when there would be very little activity on the lines and few people would be inconvenienced for the few moments, less than two minutes, it would take to cutover the new system. 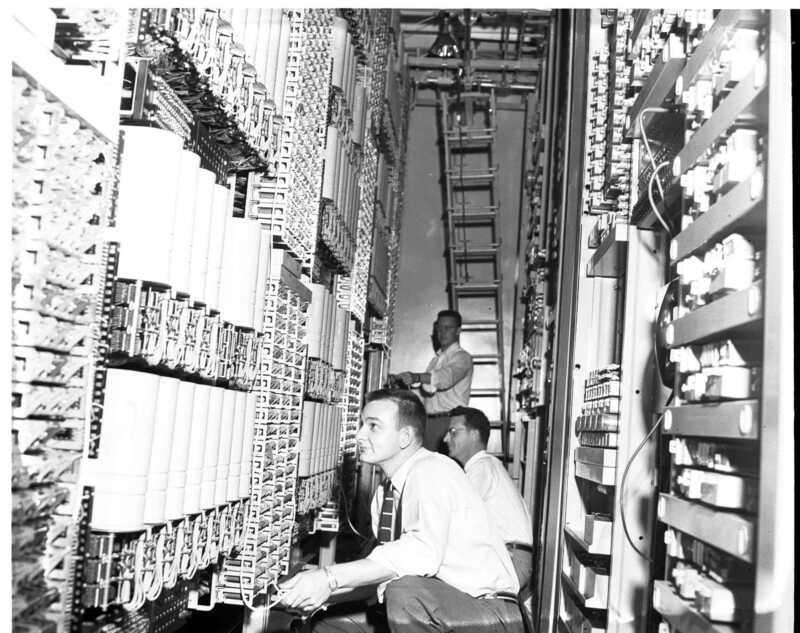 It took just 35 seconds early Sunday morning for Bell Telephone technicians to take Midland’s manual system out of operation and put more than 3,000 telephones on dial service. When the exchange “went to dial” all telephone numbers were simultaneously changed to the new “LAkeside6” (526) designation. Shortly before 3 A.M. Sunday morning operators asked customers using their phones to hang up and reconnect in two minutes using the dial. At the command “pull coils” a group of Bell employees standing behind the old main frame pulled on cords attached to hundreds of fuses, two for each line, littering the floor in seconds. With the fuses removed the old common battery switchboards were dead. Using a special phone line word was passed to the new exchange building to activate the dial equipment. Another group of men, stationed in front of the rows of switching equipment, pulled on cords attached to hundreds of blocking tools, little plastic insulators which were keeping the dial equipment from functioning. Direct dial had come to Midland. Five staff wait for the call to activate the dial system by pulling the cords and removing the blockers. Pictured are Warren Aikin, Grant Morrow and Claude Kimble. Practically all those waiting for telephones in Midland will get service with the switch to the new dial system, states H. A. Kilroy, Midland Bell manager. Twenty five additional telephones will be placed in service. Recent upgrades to rural lines will also improve service and reduce party lines to eight or less. The new long distance switchboard on the second floor is the most modern available and is almost noiseless in operation, no bells ring, no telephones jangle. 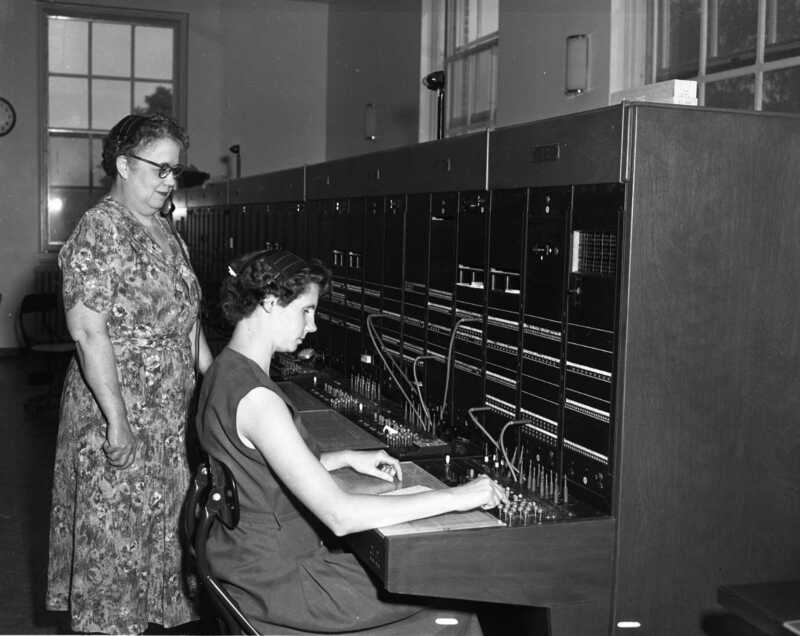 The timing of long distance calls is done by electric calculagraphs at each switchboard position. Similar to punch clocks used in factories, the operator punches a card when the call begins and when it ends. Room lights in this room are connected to an emergency power supply in the event municipal power is interrupted. The new system is powered by large storage batteries located in the basement. DC power is supplied and the batteries are charged using AC power. If the AC supply from the local utility is interrupted the system will continue to work for at least eight hours on the storage batteries. The new Midland directory, the Blue Book, contains 9,817 new and changed listings, including Barrie, Collingwood, Alliston, Beeton, Bradford, Camp Borden, Cookstown, Penetanguishene, Port McNicoll, Thornbury, Tottenham and Waubaushene. Listing are now in three columns on pages much larger than the previous books. For the second year in a row the directory features a drawing of the county court house in Barrie on its cover. The two editions of the newspaper that covered the conversion to direct dial were also full of advertisements from local merchants that highlighted their new phone numbers. Several that kept their number for many years, Hebners Taxi 526-2217, Midland Free Press until 2013 when it closed 526-5431, Wagg’s Dry Cleaners number is now used by French’s Dry Cleaners 526-5436, Chalet Blue Motel now the Silverstar still has the same number 526-6571 as does the Midland Drive-In Theatre 526-2411. This amazing technical advance took only 80 years from the day in 1876 when Alexander Graham Bell called Watson in the other room. It has been 60 years since direct dial came to Midland and technology has moved on, now we are switching to cell phones that not only let us see and talk to one another but give us access to a world of knowledge and information on the internet.